Natalie Oldfield attributes her Gran – Dulcie May, for instilling in her a love of food and that food prepared with love was at the heart of every home every day. This love of food led her to open her renowned Auckland food store – Dulcie May Kitchen, filled with baking, jams and preservers. Dulcie May Kitchen – Every day, the 3rd book for Oldfield, follows on most recently from the highly successful Gran’s family table which sold not only in NZ but off shore as well. On opening Everyday there is an immediate sense of warmth and well being that Dulcie May brand is all about. The food looks tasty yet achievable and the recipes all make perfect sense. With a modern twist on traditional favourites you will find loads of everyday choices in Dulcie May Kitchen – Everyday, including delicious looking creamed rice with rhubarb, mouthwatering pineapple and banana iceblocks and a light and fluffy spinach and mushroom roulade. Recipes such as roast lamb represent our changing society with a Thai style dressing replacing the traditional mint sauce. The recipes move through the daily meals and in betweens with a special chapter dedicated to cooking for kids – think chicken nuggets and cranberry meatloaf. Each recipe is accompanied by stylish image produced by photographer Todd Eyre. Dulcie May Kitchen is very likely to follow in the same succesful path as Gran’s Table. 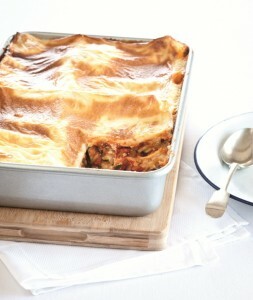 Thoroughly grease a 20 cm spring-form cake tin and line the base with non-stick baking paper. Combine the biscuit crumbs with the melted butter and press into cake tin. beat with an electric beater. 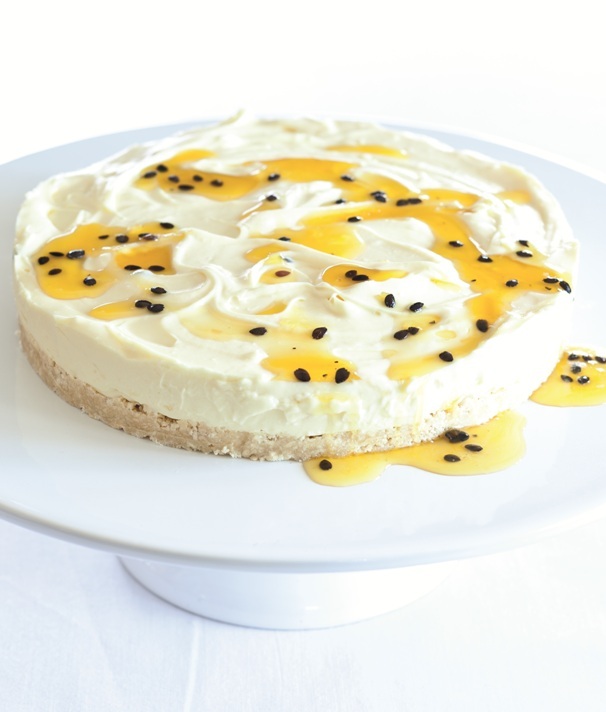 Add melted chocolate and passion fruit pulp and mix well. Preheat oven to 180°C. Grease a large lasagne dish. 8–10 minutes. Add parsley and basil and season with salt and pepper. Set aside to cool. In a separate bowl, mix together ricotta and eggs until well combined. heat and simmer for 1 minute. last lasagne sheet on top of ricotta mix and pour over white sauce. Cook for 30–40 minutes or until bubbling and golden. 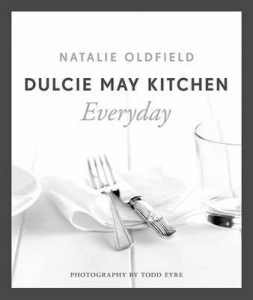 To win one of 5 copies of Dulcie May Kitchen – Everday email helen@foodlovers.co.nzwith Dulcie May in the subject line. Wow, what mouth watering recipes. My mother made her “Nutmeg Cake” and it was delicious! 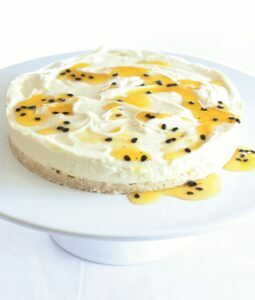 Yum – my favourite dessert & fruit combined!! Absolutely delish. We want a better plnaet – The EarthCongratulations! I liked your work so much that I saved it in the play list. Greetings – Poet Mario Afonso – Rio de Janeiro – RJ – BrazilLots of poetry, health and peace. Heard a book review over the radio and felt very drawn to the recipes. Bee Pollen is super food!!!! !Bee Pollen contains 18 amino acids, 27 viitmans, 28 minerals, 11 enzymes and co-enzymes, 24 beneficial fatty acids, 11 healthy carbohydrates and is higher in edible protein than beef, eggs and cheese, low in calories and is an iron rich food.Buying BEE POLLEN can be tricky. Don’t be confused by flower pollen which has none of the benefits added by the honeybee. Bee pollen can be ordered on line or at Whole Foods for around $15 per 16oz jar. Oh yeah and don’t ever heat the pollen it will loose most of it’s nutritional value. I have just purchased from Whitcoull’s your beautiful recipe book ‘Dulcie May Kitchen’ which I understand is your 3rd book. My question is: Where can I purchase your 1st and/or 2nd recipe book? I take a woman’s meeting every fortnight and a friend and myself did a morning with your recipes as we both have a couple of your recipe books. the ladies really enjoyed the food we cooked.